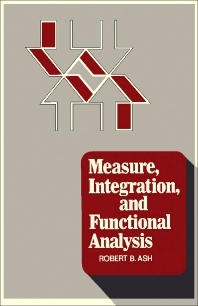 Measure, Integration, and Functional Analysis deals with the mathematical concepts of measure, integration, and functional analysis. The fundamentals of measure and integration theory are discussed, along with the interplay between measure theory and topology. Comprised of four chapters, this book begins with an overview of the basic concepts of the theory of measure and integration as a prelude to the study of probability, harmonic analysis, linear space theory, and other areas of mathematics. The reader is then introduced to a variety of applications of the basic integration theory developed in the previous chapter, with particular reference to the Radon-Nikodym theorem. The third chapter is devoted to functional analysis, with emphasis on various structures that can be defined on vector spaces. The final chapter considers the connection between measure theory and topology and looks at a result that is a companion to the monotone class theorem, together with the Daniell integral and measures on topological spaces. The book concludes with an assessment of measures on uncountably infinite product spaces and the weak convergence of measures. This book is intended for mathematics majors, most likely seniors or beginning graduate students, and students of engineering and physics who use measure theory or functional analysis in their work.